Sony Ericsson C901 runs the flash-based Media Center. Its menu lists the Photo, Music, Video, Games, RSS feeds and Settings icons. The settings menu is simple - you may opt for portrait, landscape or auto-rotate modes. The Music Player to be found in C901 is version 3.0 - a slightly abridged edition of Walkman player 3.0. Across the Media Center menus, you can enjoy screen auto-rotation. The player supports numerous file formats, including the regularly used MP3, WAV, WMA, M4A and E-AAC plus the MegaBass equalizer preset and Stereo widening. The player can naturally be set to run in the background. There's no XviD or DivX support of course, but according to Sony Ericsson, their MediaGo desktop software is enough to transfer any video from the desktop computer to the handset in the correct format and resolution to be played on the phone. Back to our C901 now, the Media center video section also houses the pre-installed YouTube client. It gives you full access to clips and uploading, bookmarked favorites and so on. The Photo gallery stores the shots you've taken, along with prebundled or uploaded images, and offers some extra options like mark as favorite and photo feed. Latest Photo provides quick access to the most recent photos. Camera Album is a thumb list for each month of the year and when a month is open, it reveals a 3 x 4 grid of photo thumbs. Scrolling down shows all the photos taken in the corresponding month with the highlighted photo slightly enlarged for better viewing. Generally, the Photo gallery is a richly-featured tool for managing your photo collection and it offers very good customization capabilities. Photo Tags displays previously marked favorite photos. The sending options include Send as Picture Msg, as Email, to Blog, via Bluetooth or even to Facebook. Uploading to Facebook is quite straightforward in 3 easy steps. Other than that, you can set a photo as wallpaper, screen saver, startup screen, and contact picture straight from the gallery. The well known Pan and Zoom and slideshow features are also on board. Finally, the C901 is capable of putting standard GPS coordinates in images using Cell-ID. When browsing tagged images in the gallery, the View-on-map option displays the location where the picture was taken directly on the preinstalled Google Maps. You can zoom in to the actual size of the picture or even beyond, yet extreme zooming won't really do any good. Browsing 5 megapixel images didn't involve any lag at all, while zooming does take a little time. The magnified section of the image preloads in low quality and only appears in full res after a couple of seconds. The audio quality of the C901 is just about the same as its mid-range Sony Ericsson siblings we have tested recently. The handset achieved excellent scores on most readings but a disastrous frequency response. On the positive side all of the other readings are pretty good with the distortion levels simply great. The stereo crosstalk, the noise level and the dynamic range are also nothing short of excellent. 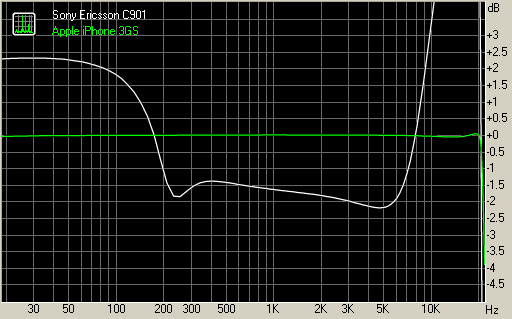 You can see for yourselves that save for the frequency response the Sony Ericsson C901 is quite a gifted musician. You can also notice its resemblance to some of the other Sony Ericsson handsets we have tested recently.